Make no mistake – the negative attention the NHS receives in the media is not unrelated to the government’s desires to dismantle and sell off our National Health Service. The NHS is widely regarded as sacrosanct – no government could destroy it without first undermining its popular support, much less a government as shaky as our current one. This is often backed up by isolated examples, such as Mid Staffordshire. 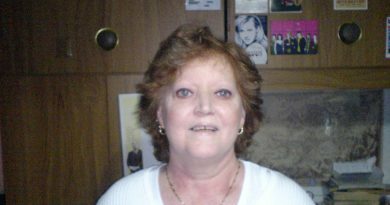 These aren’t to be ignored – they’re real cases involving the deaths of real people. 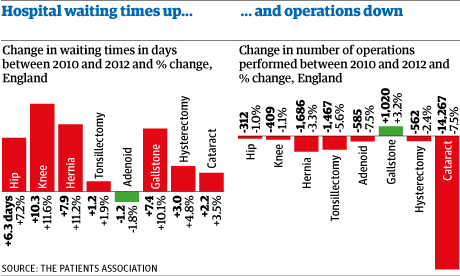 There are also other hospital trusts providing sub-par care; other NHS workers not doing their jobs properly. But you have to ask yourself: do these cases represent the NHS as a whole? We certainly should not ignore instances of failure or incompetence – but nor should we allow such cases to colour our attitude towards the entire NHS as a concept. 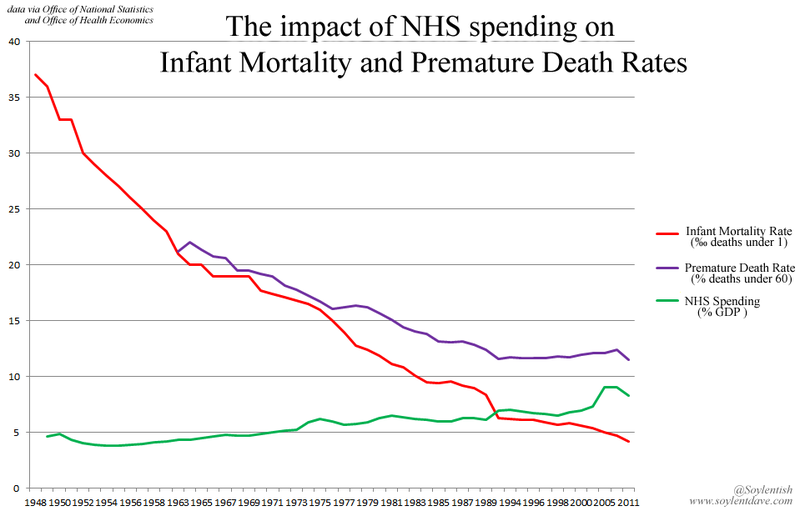 The trends show us that the NHS is, by and large, saving (and prolonging) lives. Premature death, in the days before the NHS, was measured as ‘death before the age of 60′. Nowadays the ONS wants to change that measurement to ‘death under the age of 75′. I think that’s a pretty solid testament to the achievements of our health service in the last 65 years – that ‘threescore years and ten’ would now be regarded as a premature death. In 1911, pre-NHS, 63% of Britons died prematurely. In 2011, it was 11.5%. Contrary to popular belief, the NHS actually ranks amongst the most cost-effective healthcare services in the world. 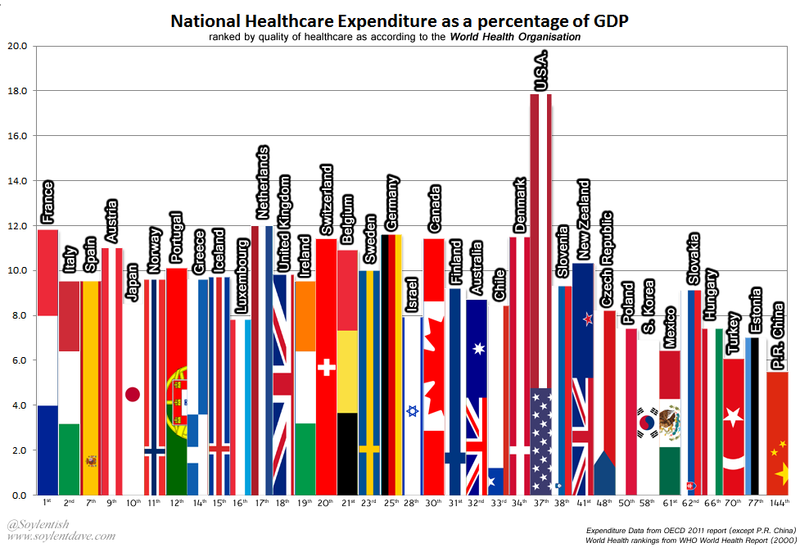 Note also that the poster-boy for privatised healthcare, the USA, languishes far below most nations with socialised healthcare (and the NHS in particular), despite spending considerably more on healthcare. That should tell us that, when there are problems with the NHS, the solution isn’t “sell it off to the lowest bidder”. Privatisation is how you end up with healthcare that’s low quality and high-cost – the worst of both worlds. The first part of this is true – NHS spending has been increasing in real terms since its inception. In 1948, the NHS cost us £266.27 each, yearly (adjusted). 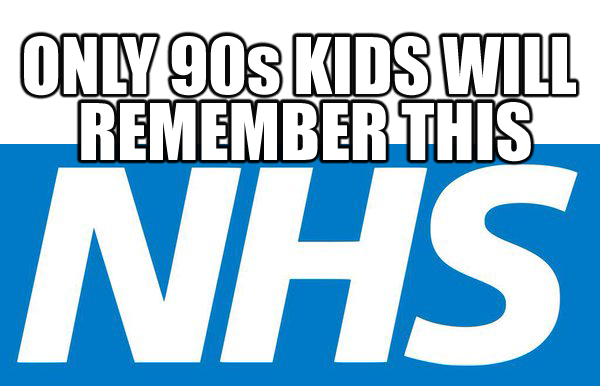 In 2011, the NHS costs us £1905.99 each per annum. 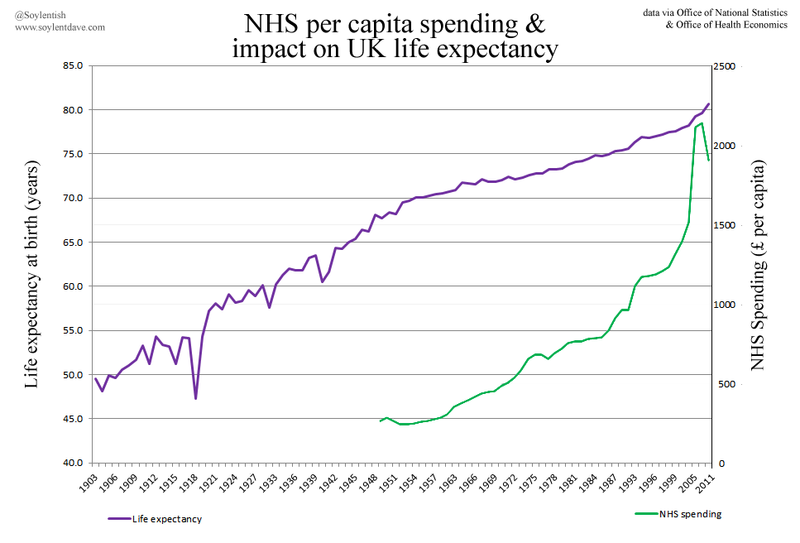 As you can see from the graph, the advent of the NHS isn’t entirely responsible for the upward trend in life expectancy – but it does seem to be responsible for stabilising the upward trend. We haven’t had any sudden downward troughs since 1948. But more than that, healthcare in general is expensive. Is the NHS worth £1905.99 a year to you? By comparison, the typical US outlay for Health Insurance is roughly £3150 for a single person, or £8800 for a family. Does it seem expensive now? The Labour Party and the NHS are inextricably linked, thanks largely to Aneurin Bevan. This is a double-edged sword – those who love the NHS favour the Labour party for its creation, but also expect Labour to take good care of its baby (and rightly so). 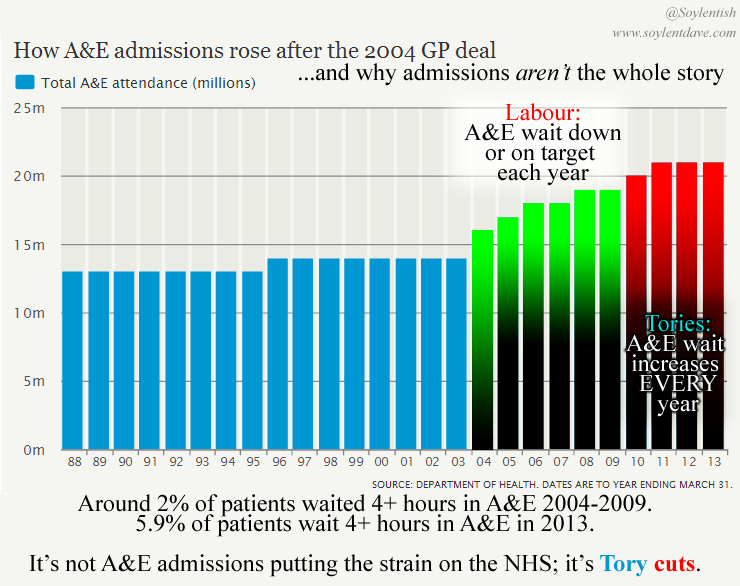 One thing you may also notice from all the above graphs is a general increase in A&E spending – particularly in Labour government years. 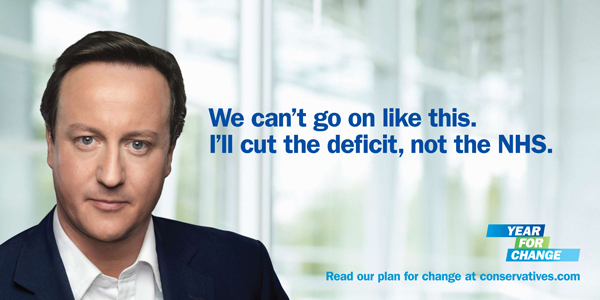 Right up until 2010, when our current government shamelessly broke its pre-election promise and cut funding to the NHS. … although probably without my annotations. 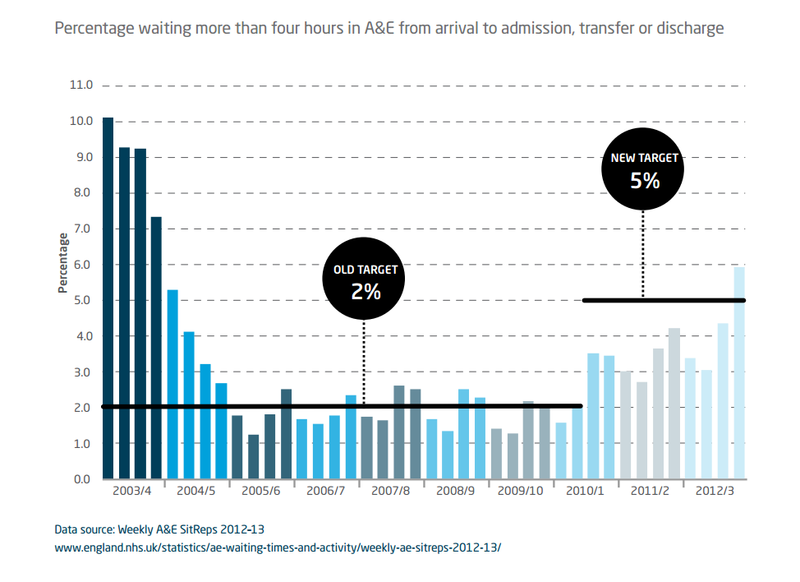 Which is a shame, because the waiting list data is far more notable than anything to do with admission numbers. It doesn’t matter if the number of hospital admissions are going up (which they will do anyway, as the population rises); what matters is can the NHS cope with it? And it turns out that, prior to 2011, it could. 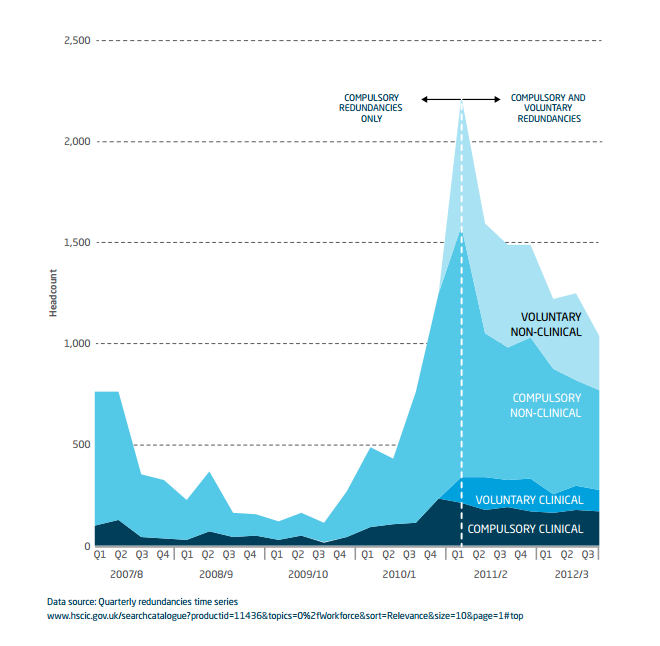 What happened in 2010 that suddenly broke the NHS? Was it the sudden change in government driving them to despair? Was it the series of A&E closures across the UK (including Trafford General Hospital, the first NHS hospital in the UK)? Was it perhaps all the compulsory redundancies? We have a party in government who have planned (or at least wished) to privatise the NHS since the 1980s. 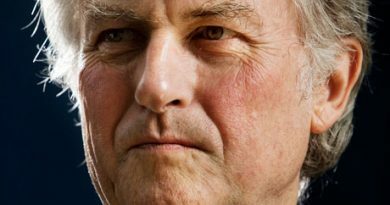 We have a party in government who are blaming the previous incumbents (or female GPs!) for the failure of the NHS, even as they cut frontline services and staff. I think we have a government who not only wish to dismantle our NHS, but who think the electorate are stupid. …which is only failing because they’re cutting its staff and funding. Don’t let them get away with this. It is always interesting to read these posts and compare to the situation in Germany. Instead of one single NHS, we have more than a hundred (mostly redundant) “Gesetzliche Krankenkassen” (statutory health insurance). It is mandatory to be a member of one of them, unless you pick a private health insurance company. Then there are completely stupid rules where public officers are forbidden to be member of one of the statutories, and effectively forced to chose a private one. I have no idea why this is the case, it makes no sense whatsoever. Now, for more than a decade, politics and media keep claiming how inefficient the statutory health insurance is, and how efficient the private ones are (they say that about anything public vs private). 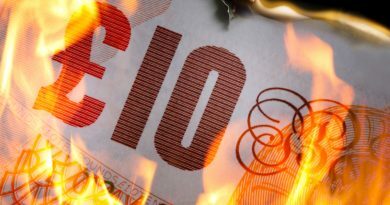 They talk about an explosion of cost and imminent collapse of the system while at the same time, the pool of money for the statutories (they get money from a shared pool) has been in the plus for years. There is no deficit, the system works. But the private ones want their profits, and their lackeys in politics want to ensure they get them. We are regularly threatened by parties planning major overhauls of the system always in favor of the private companies, detrimental to the public ones. Now, to at least give some real numbers, the minimum amount of monthly insurance fee in statutory health insurance, if you are considered without neither income nor unemployment benefits (which applies, for example, to people who live at home, have a partner with a job, but no income of their own, and are not married) is about ~150 Euros. That’s 1800 per annum. Euros, not British Pounds. If you are employed the rate depends on your salary (by percentage), split in almost half between you and your employed (you pay a bit more). However, these rates are about the same numbers the private insurance companies try to lure in young, healthy people with a fairly decent income. Then the rates go up over time, due to many factors including age, ilnesses/injuries, inflation etc. If you can’t maintain a high enough income throughout all your life, you are eventually screwed. People who start with <200 Euros when they are in their twenties, might very well have to pay 800-1000 when they retire (and typically have less money available than before retirement). Iirc there are special laws that then force the statutories to accept back some of those people who basically fall out of the privatized half of the system. But there are also cases where people end up being without health insurance because they were tricked into a contract they cannot keep up with throughout their life. a) That there are more than a hundred completely redundant public health insurance companies, all with their own administration overhead. b) That there are private health insurance companies who act as a way for the rich the escape the solidary public health system (i.e. mere egoists who want to deny the public their larger share), but also managed to trick not-so-wealthy people at younger age into insurance contracts that start out nice and cheap, then get worse over time. c) That there is an agenda across many (not all!) parties to abolish public health insurance, step by step, by making it worse and supporting, both through legislation and through propaganda, the private companies. Point a) can be solved by merging them into one. Points b) by legislation to abolish private health insurance altogether. Not gonna happen, of course, because of c). P.S. : Cases of the NHS "killing" people would not have been better in a privatized system. To the contrary, such cases would likely increase in numbers.